An orchestral model with cutaway featuring the N2 neck and high-quality onboard electronics. 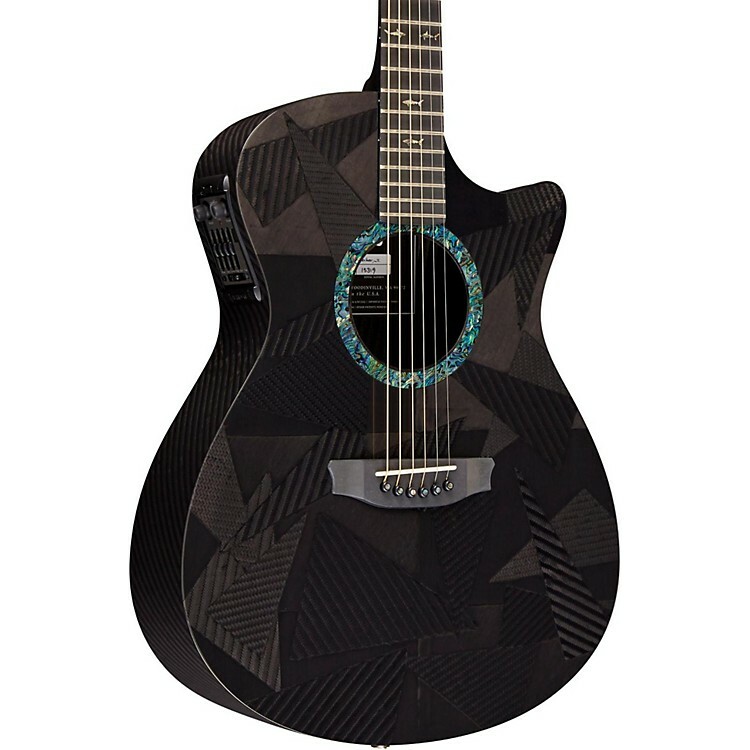 The Black Ice Series Orchestra acoustic-electric guitar embodies artistry. Each instrument is unique. The soundboard on each guitar is meticulously crafted to achieve an aesthetically pleasing appearance without overbuilding it. Each soundboard is individually conceived so every guitar is unique. Unique in design and unique in tone. The RainSong Orchestra Model (OM) is the smallest and most refined of all RainSong shapes. It is their most comfortable and intimate guitar, with an immediacy of presence that makes it a favorite with the coffee house crowd. The treble, already a breathtaking attribute of RainSongs, and the carbon sound are simply sublime in this little guitar. A crystal-bell clarity, balance, superb separation of individual notes, and an expansive dynamic range make the OM one of RainSong's most individually expressive guitars. Because of Projection Tuned Layering, the OM is capable of strong projection. It won't rattle windows like the Jumbo or the Dreadnought, but the OM, when driven, packs a lot of power and punch for a small bodied guitar. The N1 is the original RainSong 6-string low-profile neck. It is unique in design, with a feel that is at once comfortable and different, this neck is easy to play. Pre-engineered for optimal relief, the N1 does not include a truss rod. The N2 neck is a result of an extensive, long-term collaboration with the renowned artist Steve Miller and Master Luthier John Bolin. The neck design is based on a modified "U" profile that has been popular in guitars since the 1950s. While the N2 has a more substantial feel than the N1, it is ergonomically sound and actually results in better transfer of string vibration energy to the soundboard. The N2 features a truss rod that is accessible from the head stock. Graphite does not warp or bow with changes in humidity and temperature. The purpose of a truss rod in the N2 is to allow customization of the relief to suit individual preferences. Enjoy this dramatic evolution in guitar construction for yourself. Order today. Neck width at nut: 1.75"